There’s nothing like a steaming bowl of hot Soup to warm you on a cold autumn or winter evening. 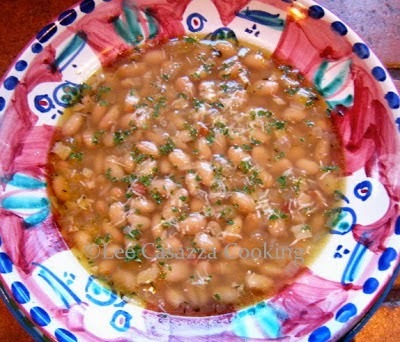 This soup is made with canned beans instead of dried beans, making it quick and easy. Any variety of white canned beans will be great with this soup, from the smaller navy bean to the medium great northern bean and the larger cannellini bean. In a large pot or Dutch oven, fry the pancetta over medium heat until golden. Add the oil to the pot and sauté the onion until soft and translucent, about 10 minutes. Add the thyme sprigs, bay leaves, chicken stock, beans, and cheese rind. Season to taste with salt and pepper and simmer for about 25 minutes. Remove the thyme sprigs, bay leaves, and cheese rind. Ladle soup into bowls and sprinkle with parsley. Serve with grated Parmigiano cheese and a drizzle of extra-virgin olive oil.